Kim Jong Un tours flood recovery work in Raso’n (Photo: Rodong Sinmun). DPRK state media reported on September 18 (Friday) that Kim Jong Un (Kim Cho’ng-u’n) toured flood recovery efforts in Raso’n. Also in attendance were VMar Hwang Pyong So (Director of the Korean’s People’s Army [KPA] General Political Department), Gen. Pak Yong Sik (Minister of the People’s Armed Forces), Ri Il Hwan (Director of the Workers’ Party of Korea [WPK] Workers’ Organizations Department), Jo Yong Won (deputy director of the WPK Finance and Accounting Department) and Lt. Gen. Ryom Chol Song (deputy director of the KPA General Political Department). 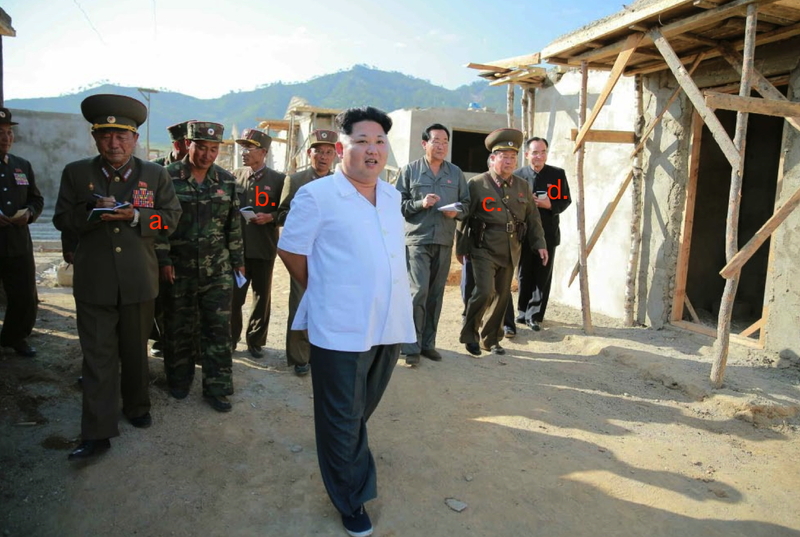 Kim Jong Un tours flood recovery efforts in Raso’n. Also in attendance are Gen. Pak Yong Sik (a.). Lt. Gen. Ryom Chol Song (b.) Jong Un’s head of security (c.) and Jo Yong Won (d.) (Photo: Rodong Sinmun). 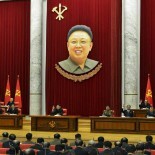 This entry was posted on 09/21/2015 by nkleadershipwatch in Central Committee, Central Military Committee, Civil Defense Department, corps command, critical infrastructure, DPRK Cabinet, DPRK Civil Defense Forces, DPRK Disaster Relief, DPRK Premier, Economic Complexes, Events Management Section, Finance and Accounting, flood damage 2015, Gen. Pak Yong Sik (MPAF), General Affairs, Guard Command, Hwang Pyong So, Hwang Pyong So (GPD; KPA VMAR), internal security, Jo Yong Won, Kim Chong-un inspections, Kim Jong Un Visits, Kim Jong-un, KJI Personal Secretariat, Korean People's Army (KPA), Korean People's Army Supreme Command, Korean People's Internal Security Forces, Korean Workers' Party (KWP), KPA construction battalions, KPA construction brigades, KPA General Logistics Department, KPA General Political Department, KPA General Staff, KPA supernumerary organizations, KPA Supreme Command, kpif, land and enviroment, local people's committees, Lt. Gen. Ryom Chol Song, military security command [msc], Ministry of Construction and Building Materials Industry, Ministry of Food and Consumer Goods, Ministry of Food and Procurement, Ministry of Land and Environmental Protection, ministry of people's security, Ministry of State Security, Ministry of the People's Armed Forces (MPAF), MPAF GPB, naso'n, nason, National Defense Commission (NDC), North Korean press, Organization and Guidance Department, Pak Pong Ju, party life, Political Bureau, population control, primary party committees, Provincial Party Committees, Provinicial People's Committee, Rajin-So'nbong People's Committee, raso'n, Raso'n Economic Zone, reserve training units, Ri Il Hwan, Secretariat, State Planning Commission (SPC), State Security Department, Workers' and Social Organizations.